The alternatives to carry out this walk are varied it can be made to horse, in 4x4 or in bicycle, for the adventurers there are not limits and from here they are organized every year groups of venturesome. Here the first recommendation: It is very important to have support to enjoy beginning in order to the journey. The loners can meet with smaller inconveniences, for it Berrotarán is headquarters of encounter of organized groups. This time the two wheels were the means of transport elect. The bicycles should be well equipped. As part of the minimum team good controls are recommended, tuned changes and covered with drawing. The supply of water is a detail to keep in mind, since not the whole itinerary has streams for the supply. From the Saturnine Square Berrotarán until the denominated Marquéz of Sobremonte, in the heart merlino, an exists on the way to something more than 93 Km . The journey is serpenteante and wavy. To each step the landscape is a gift of the rich Cordovan geography and of the history of the place. Each point enters some construction, more refined today, but with a great resemblance to the semiburied shacks, the natives' of the region habitat. They limited their territories with stones (pircas) either forming corrals, vegetable gardens, or land extensions that today can still be admired. 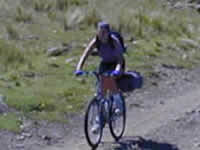 It is of hoping the cyclists are surprised by foxes, pumas, hares, vizcachas, partridges and a great variety of reptiles. The sheep, goats, cows and horses are plentiful. It is good to make night in the road. The dawns are extraordinary: clouds below the feet, colors that go changing from the gray one until the most brilliant reddish and the orange sun crowning the image. The options are in Rodeo of the Mares or in The Valleys. To 56,5 Km of the journey the Place Rodeo of the Mares, property of Mr. Norberto will appear Rodríguez. Here knew how to work a center of supply. A poster announces the presence of a kiosk. Ducks, geeses and other birds intervene in the road. 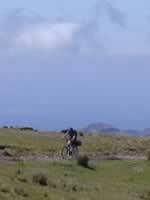 The second alternative will be after to travel 5 more km and to meet with the Bifurcation "Rough Hill - The Valleys". The Valleys are a very meticulous town. In the distance houses can be done with red roof and worked fields, but it will only serve as refuge and place of rest since any road that allows to cross the mountain doesn't exist. Several tracts must make on foot. Hills of 45º, sometimes with loose rocks, they mix with reconfortantes descents. The difference is important: The journey begins to 658 meters on the level of the sea, the deviation to The Valleys is located to 1578 msnm and from there it is still necessary to climb more than 500 m to arrive to the Limit Interprovincial (2138 msnm). This limit is marked clearly for the beginning of the asphalted road: the glory after the physical effort. Before sighting it the road it begins to be furrowed by threads of water very gratificantes. The greens and the ochers tinged in the landscape. The road is a great engineering work: The mountain was modeled leaving to the overdraft each horizon especially. The curves are very marked, respecting the traffic norms is prevailing. In bicycle you ends up quickly reaching a speed of 50 km/h . Although it is already enjoyed the view from above, to take a recess in the Mirador of the Sun (1454 msnm) it is a privilege. The Villa is exposed ordinate. They accompany in the place some artisans, those that the colorful rocks of the area work with their art. From here it is also admired to valiant parapentistas that pose from the air for pictures. The Villa of Merlo is a city like that of the stories... you marry to two waters, splendid, gardens full with flowers, handmade trade, tourist proposals to relax himself. 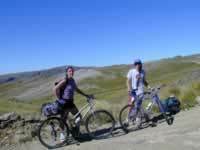 The voyage Córdoba - San Luis in bicycle is a worthy experience of living, it is only necessary to cheer up.